Java (Indonesian, Javanese, and Sundanese: Jawa also spelled "Djawa") is an island of Indonesia and the site of its capital city, Jakarta. Once the center of powerful Hindu kingdoms and the core of the colonial Dutch East Indies, Java now plays a dominant role in the economic and political life of Indonesia. With a population of over 140 million, it is the most populous island in the world; it is also one of the most densely populated regions on Earth. Formed mostly as the result of volcanic events, Java is the 12th largest island in the world and the fourth largest island of Indonesia. A chain of volcanic mountains form an east-west spine along the island. It has three main languages, and most residents are bilingual, with Indonesian as their second language. While the majority of Javanese are Muslim, Java has a diverse mixture of religious beliefs and cultures. Outsiders often referred to Java and the neighboring islands by the same name, or use names inconsistently for different islands. For example, Marco Polo referred to neighboring Sumatra as "little Java"  and Ptolemy referred to Sumatra as Jaba-diu. Java is part of the Sunda Island Arc, which includes Sumatra to the northwest and Bali to the east. Located northwest of Australia, Borneo lies to the north, Christmas Island to the south and Bali to the east. 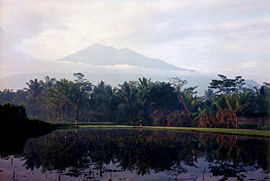 Java is almost entirely of volcanic origin; it contains no fewer than 112 volcanoes, forty-five of which are active. The mountains form a spine which runs east to west and are flanked by limestone ridges and lowlands. The highest volcano in Java is Mount Semeru at 12,060 feet (3,676 meters). The most active volcano in Java and also in Indonesia is Mount Merapi (2,914 m). Further mountains and highlands help to split the interior into a series of relatively isolated regions suitable for wet-rice cultivation; the rice lands of Java are among the richest in the world. Indonesia's capital, Jakarta, is located on the northwest area of Java with Surabaya (the second largest city in Indonesia), located in eastern Java. Popular tourist destinations include the city of Yogyakarta, the huge Buddhist stupa complex of Borobudur, the Hindu temples at Prambanan, and Mount Bromo in East Java. The island of Java is located almost entirely in the equatorial rain belt. It experiences a typical tropical climate including high levels of rainfall, high temperatures and high humidity. Java experiences two seasons, a wet or rainy season from December to March and a dry season from May to October. Temperatures in the wet season range from 21 degrees Celsius (70 degrees Fahrenheit) to 33 degrees Celsius (90 degrees Fahrenheit), except at higher altitudes, which can be much cooler. The lowest average temperature is 18 degrees Celsius (65 degrees Fahrenheit). Trade and monsoon winds from the Indian and Pacific Oceans produce a more moderate climate. The flora and fauna of Indonesia and therefore Java, are completely different from that of neighboring continental Asia and Australia, as well as from the flora of other tropical areas in the world. Within the Indonesian archipelago lies one of the most remarkable zoogeographical boundaries in the world, which dates back to the glacial period when the sea level fell worldwide. Java, Sumatra, and Kalimantan lay on the Sunda shelf during that glacial period and were joined to each other and to the mainland of Asia, while Papua and the Australian continent at that time lay on the Sahul shelf. This original geographical segregation explains why the typical oriental fauna species found in Java, Sumatra and Kalimantan are completely lacking in Papua. Also, the marsupials found in Papua, do not occur in the Oriental Region. Although the two regions are only 50 km from each other across the Makassar strait, the majority of fauna in one area does not occur in the other. Java's vegetation includes eak, rasamala, and casuarina trees and bamboo in forest stands, together with sago palms and banyan trees. The vegetation is southern Asian, with Australian affinities and includes more than 5,000 species of plants. Dense rainforests cover most of the damp slopes of the mountains, while the west supports thick bamboo woods. Java fruit trees include banana, mango, and other various Asian species. The island of Java is known for several important finds of early hominid specimens . In particular, the 1891 discovery of cranial fossil remains commonly known as "Java man" (now designated as Trinil 2, after the Trinil site on the Bengawan Solo River) is notable as the first early hominid specimen found outside of Europe. This find, and several subsequent ones at various locations along the river's valleys, are now generally classified in the species Homo erectus. Like modern man, the thigh bones of Java man showed that he walked fully erect and attained approximately 170 centimeters (5 feet 8 inches) in height. The colonization of Java dates back as early as 2500 B.C.E., when domestic agriculture is known to have been practiced there. Around the first century C.E., Indian traders began arriving. The development of the Kingdom of Mataram in the eighth century was influenced by these traders. Although originally Hindus, later Mataram kings accepted Mahayana Buddhism. The great Buddhist movements began shortly after this in the eighth and ninth centuries. These Buddhist movements were responsible for the construction of Borobudur, Mendut, and many other sites in Java. Java was then influenced or ruled by several empires including the Srivijayan, under which literature and the arts flourished, and the Hindu epics were translated from Sanskrit into Javanese. This allowed for the diffusion of Hindu Thought among the common people. The empire was further divided and one of the kingdoms, the Kediri (along the Brantas River) became the most powerful. During the thirteenth century, this area remained the center of Javanese culture and became the center of the spice trade. Both Muslim traders from India as well as Chinese merchants visited Java during this time. The political center of Java then moved to the kingdom of Singhasari, in the Malang Highlands of eastern Java. King Kertanagara (reign 1268–92), unified Java and extended his power to southern Borneo, Bali, and other eastern islands. After his death, King Kertanagara's kingdom collapsed and was succeeded by the Majapahit Empire of eastern Java, which was founded in 1293. Most of the Indonesian archipelago was controlled by the Majapahit dynasty. The Majapahit declined in the late fourteenth century, and probably fell early in the sixteenth century, when the followers of Islam destroyed the last vestige of Indo-Javanese rule. The name of the Majapahit empire is still invoked by contemporary Indonesian leaders to promote "unity" and the legitimacy of the state. The remnants of the Majapahit's priests, royalties, and artisans, fled to Bali during the sixteenth century, as Muslim kingdoms in the coastal part of the island gained influence. Although Muslims had visited for centuries, as the Muslim international trade network in the region grew, the coastal Javanese were faced with the choice of fighting or joining the Muslims. Many eventually chose to join them. The earliest Muslim evangelists were called the Wali Songo, or the "nine ambassadors." Several of them were of Chinese origin, leading to speculation about Zheng He's influence on the trade in the Straits of Malacca. Many of their tombs are still well-preserved, and often visited "Ziarah" for superstitious and religious reasons. Most of the brand of Islam that is adopted in Java is mixed with long-standing indigenous beliefs, and has a decidedly "local flavor." For example, the legend of Nyi Roro Kidul was invented as a mix of the beliefs common on the southern coast of Java, with Islamic influences. In 1596 the Dutch first arrived on Java and in 1603, the first permanent Dutch trading post in Indonesia was established in Banten, northwest Java. The Dutch established the Dutch East India Company (VOC) with its trading and administrative headquarters in Batavia in 1611, known now as the capital city, Jakarta. This capital, along with other coastal cities such as Semarang and Surabaya, was the focus of Dutch attention during most of the colonial period. The VOC maintained control over the mountainous interior of the island through indigenous client states, such as Mataram in central Java. The once-powerful Javanese empire had disintegrated as the native states were gradually absorbed. The nineteenth century saw the Dutch government take over administration of Indonesia from the VOC, and in the mid-nineteenth century new policies, known as the Culture System, were implemented. These policies, intended to increase the profitability of the colony by requiring increased production of cash crops, led to famine and widespread poverty on Java. Java was under British rule, headed by Sir Thomas Raffles, from 1811 to 1815. Raffles had tried to institute reforms in Java but these were ignored by the Dutch when they returned to power, using instead harsh methods of exploitation and a system of forced labor. This led to a native uprising, led by Prince Diponegoro, between 1825 and 1830 that was eventually suppressed, at great expense, by the Dutch. After the uprising, a more humane approach was adopted by the Dutch. By the beginning of the twentieth century, protest over the government policy's effects, coupled with political changes in the Netherlands and in the Indies led to the "Ethical Policy." This policy of increased investment in the colony gave many more Javanese elites access to a Dutch education, both in Java and in the Netherlands itself. It was from this elite that the most prominent nationalist leaders came. They formed the core of the new government when Indonesia became a Republic following World War II. After the Allied defeat in the battle of the Java Sea in February 1942, Java was occupied by the Japanese for the remainder of World War II. After the end of the war, Java was subjected to intense fighting between Dutch and Indonesian forces. In 1945, the Indonesians declared independence from the Netherlands. The Republic of Indonesia was proclaimed in 1945 with the Netherlands retaining possession of a large part of the region. Following a protracted struggle for independence, the Republic of the United States of Indonesia was established in 1949. With the establishment of Jakarta as the capital and the Javanese roots of the majority of Indonesian political figures, the island has a dominant role in the political and economic life of the nation. While parts of rural Java are among the poorest in the nation, the urban areas of the island are Indonesia's wealthiest and most urbanized areas. Presidents Sukarno (1945–1965), Suharto (1965–1998), Abdurrahman Wahid a.k.a GusDur (1999–2001), Megawati Sukarnoputri (2001–2004), and Susilo Bambang Yudhoyono (2004- ) were all from Java. The only president who was not from Java was Baharuddin Jusuf Habibie (1998–1999). This political dominance has resulted in resentment on the part of some residents of other islands. Indonesian author Pramoedya Ananta Toer, once recommended that the Indonesian capital be moved outside the island of Java, in order to free the Indonesian nationalist movement from its Java-centric character. The island of Java is a combination of 4 provinces and 2 districts, and there is no government responsible solely for Java. Each province has its own government, with the Indonesian government responsible for federal issues. The Republic of Indonesia is divided into provinces (Provinsi). Provinces are further divided into regencies (Kabupaten) and cities (Kota). Provinces, regencies and cities, have their own local governments and parliamentary bodies. The province is the highest tier of local government sub–national entity in Indonesia. Each province has its own local government, headed by a governor, and has its own legislative body. The governor and member of local representatives are elected by popular vote for 5 year terms. Regencies are usually headed by a Regent while cities are headed by a Mayor. Java is responsible for most of Indonesia's sugar cane and kapok with more than two-thirds of the island under cultivation. In addition to these two products, rubber, tea, coffee, tobacco, cacao, and cinchona (the source of quinine) are grown in western highland plantations and exported. Corn, maize, cassava, peanuts, soybeans, and sweet potatoes are produced in the lowlands mostly on peasant landholdings. Rice is the chief small-farm crop. Cattle are raised in the east, and livestock, especially water buffalo, is raised for use as draft animals. Ponds and rice fields in central and western Java also support fish farming. Most of the world's quinine is produced in Java. Off the northwestern coast are important oil fields, linked to Cilegon by a natural-gas pipeline. Refineries are located in Cilacap, Jepu and Surabaya. Tin, gold, silver, copper, coal, manganese, phosphate, and sulfur are mined in limited quantities. Most of the Indonesia's manufacturing establishments are located on Java. Industry is centered chiefly in Jakarta and Surabaya. Larger industries include rubber manufacturing, auto assembly, textile processing (mostly in Bandung), brewing and the production of shoes, paper, soap, cement and cigarettes. Jakarta has an international airport and Surabaya and Tanjungpriuk (near Jakarta) are the main sea ports. From the 1970s to the fall of the Suharto regime in 1998, the Indonesian government ran a Transmigration Program aimed at resettling the population of Java on other less-populated islands of Indonesia. This program met with mixed results, and sometimes caused conflicts between the locals and the recently-arrived settlers. Generally speaking, the three major cultures of Java are the Sundanese culture of West Java, the Central Javanese culture, and the Eastern Javanese culture. In the southwestern part of Central Java, usually named the Banyumasan region, a cultural mingling occurred; bringing together Javanese culture and Sundanese culture to create the Banyumasan culture. In the central Javanese court cities of Yogyakarta and Surakarta, contemporary kings trace their lineages back to the pre-colonial Islamic kingdoms that ruled the region, making those places especially strong repositories of classical Javanese culture. Classic arts of Java include gamelan music and wayang puppet shows. 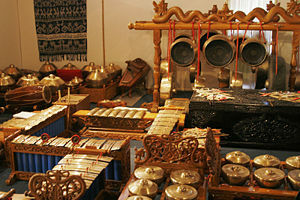 Java acts as Indonesia's center of cultural and economic activity. Java was the site of many influential kingdoms in the Southeast Asian region, and as a result, many literary works have been written by Javanese authors. These include Ken Arok and Ken Dedes, the story of the orphan who usurped his king, and married the queen of the ancient Javanese kingdom; and translations of the Ramayana and Mahabarata. Pramoedya Ananta Toer is a famous contemporary Indonesian author, who has written many stories based on his own experiences of having grown up in Java, and takes many elements from Javanese folklore and historical legends. The Javanese people recognize several classes of supernatural beings. One class is the frightening Memedi, which includes the gendruwo. The Gendruwo are believed to appear in the form of familiar relatives, kidnap a person and render him or her invisible. If the victim unwittingly accepts food from the gendruwo spirit, he or she will remain invisible forever. Ratu Kidul, the Queen of the South Sea, is considered the greatest spirit and is believed to be the mystical bride of Java's rulers. Young men avoid wearing green, the Queen's favorite color, while at the Indian Ocean, in order to avoid being pulled down into her underwater realm. The wali songo are another set of legendary figures. They are the nine holy men who brought Islam to Java. They are credited with magical powers such as flying. Traditional Javanese dance incorporates graceful hand movements and precise control of the body. Young women symbolically enact combat in the most revered dances; the bedoyo and srimpi, while the folktale characters are portrayed in the male dancing which includes the tari topeng. 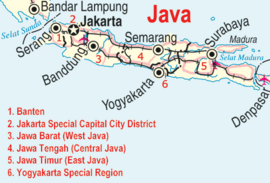 The three major languages spoken on Java are Javanese, Sundanese and Madurese. Other languages spoken include Betawi (a Malay dialect local to the Jakarta region), Osing and Tenggerese (closely related to Javanese), Badui (closely related to Sundanese), Kangeanese (closely related to Madurese), and Balinese. Other sources may list some of these as dialects rather than languages. The vast majority of the population also speaks Indonesian, generally as a second language. There are three main dialects of Modern Javanese: Central Javanese, Eastern Javanese and Western Javanese. All Javanese dialects are more or less mutually intelligible. Sundanese (Basa Sunda, literally "language of Sunda") is the language of about 27 million people from the western third of Java or about 15 percent of the Indonesian population. Madurese is the spoken language of people from Madura Island and is also spoken on Kangean Islands, Sapudi Islands, and in the eastern part of the province of East Java. It was traditionally written in the Javanese script, but the Roman script is now more commonly used. The number of speakers, though shrinking, is estimated to be 8-10 million. The Javanese language is the spoken language of those in the central and eastern part of the island and is the native language of approximately 80 million people. It is part of the Austronesian family, and is therefore related to Indonesian and Malay languages. Many speakers of Javanese also speak Indonesian for official and business purposes, and to communicate with non-Javanese Indonesians. Javanese can be regarded as one of the classical languages of the world, with a vast literature spanning more than 12 centuries. Although not currently an official language anywhere, Javanese is the Austronesian language with the largest number of native speakers. Four out of five Indonesian presidents since 1945 were of Javanese descent. It is therefore not surprising that Javanese has a deep impact on the development of Indonesian, the national language of Indonesia, which is a modern dialect of Malay. The vast majority of Javanese are Muslim, however, only a portion regularly follow the "five pillars of Islam" and other practices of orthodox, Middle Eastern Islam. These Muslims are referred to as santri' and can then be divided into two subgroups; the "conservatives" and the "modernists." While the "conservatives" adhere to orthodox Islam as it has been practiced by the Javanese for centuries, the "modernists" reject the local traditions and adhere to a form of Islam preferred by Western-style educational institutions. Java has been a melting pot of religions and cultures, which has created a broad range of religious beliefs. The Indonesian constitution recognizes six official religions; (Islam, Protestantism, Catholicism, Buddhism, Hinduism and Confucianism). As much as 12 percent of the population adhere to religions other than Islam. There are several hundred thousand Christians. Among these, Roman Catholics are particularly numerous. Small Hindu enclaves are scattered throughout Java, but there is a large Hindu population along the eastern coast nearest Bali, especially around the town of Banyuwangi. There are also Prostestant Christian communities, mostly in the larger cities, though some rural areas of south-central Java are strongly Roman Catholic. Buddhist communities also exist in the major cities, primarily among the Chinese Indonesian. Indian influences came first with Shivaism and Buddhism penetrating deeply into society, blending with indigenous tradition and culture. One conduit for these were the ascetics, called resi, who taught mystical practices. A resi lived surrounded by students, who took care of their master's daily needs. Resi's authorities was merely ceremonial. At the courts, Brahmin clerics and pudjangga (sacred literati) legitimized rulers and linked Hindu cosmology to their political needs. Pre-Islamic Javanese traditions have encouraged Islam in a mystical direction. There emerged in Java a loosely structured society of religious leadership, revolving around kyais, possessing various degrees of proficiency in pre-Islamic and Islamic lore, dogma and practice. The kyais are the principal intermediaries between the villages masses and the realm of the supernatural. However, this very looseness of kyai leadership structure has promoted schism. There were often sharp divisions between orthodox kyais, who merely instructed in Islamic law, with those who taught mysticism and those who sought reformed Islam with modern scientific concepts. As a result, there is a division between santri, who believe that they are more orthodox in their Islamic belief and practice, with abangan, who has mixed pre-Islamic animistic and Hindu-Indian concepts with a superficial acceptance of Islamic dogma. ↑ Thomas Stamford Raffles, The History of Java Oxford in Asia historical reprints. (Kuala Lumpur: Oxford University Press, 1979), 2-3. ↑ Asiatick researches, or, Transactions of the society instituted in Bengal, for inquiring into the history and antiquities, the arts, sciences, and literature, of Asia (London: Printed by T. Maiden, for Vernor, Hood, and Sharpe; Cuthell and Martin, 1806–1807), 38. ↑ United Nations Environment Programme Islands by Land Area Retrieved January 18, 2019. ↑ 5.0 5.1 5.2 5.3 5.4 5.5 Encyclopedia Britannica Java Retrieved January 18, 2019. ↑ 6.0 6.1 M. C. Ricklefs, A History of Modern Indonesia since c. 1300 (Houndmills, Basingstoke, Hampshire: Macmillan, 1993, ISBN 033357690X). ↑ William H. Frederick and Robert L. Worden (eds. ), Indonesia: A Country Study (Washington: GPO for the Library of Congress, 1993) U.S. Library of Congress. Indonesia – Early History Retrieved January 18, 2019. ↑ Encyclopedia Britannica. Java Man Retrieved January 18, 2019. ↑ Joshua Calder, World’s Most Populous Islands 2007. Retrieved January 18, 2019. ↑ Encyclopedia Britanica. Gamelan Retrieved January 18, 2019. ↑ Encyclopedia Britanica.Wayang Retrieved January 18, 2019. ↑ 12.0 12.1 World Cultures, Javanese Retrieved January 18, 2019. ↑ Raymond G. Gordon, Jr. (ed. ), Ethnologue: Languages of the World, Fifteenth edition. (Dallas, TX: SIL International, 2005). ↑ 14.0 14.1 14.2 14.3 14.4 14.5 Justus M. van der Kroef, New Religious Sects in Java Far Eastern Survey 30(2) (1961):18—15. Retrieved January 18, 2019. ↑ Andrew Beatty, Varieties of Javanese Religion: An Anthropological Account (Cambridge University Press, 1999, ISBN 0521624738). Frederick, William H., and Robert L. Worden, (eds.) Indonesia: A Country Study. (Washington: GPO for the Library of Congress, 1993.) U.S. Library of Congress. Indonesia – Early History Retrieved January 18, 2019. Gordon, Raymond G., Jr. (ed.). Ethnologue: Languages of the World, Fifteenth edition. Dallas, TX: SIL International, 2005. Languages of Java and Bali "Ethnologue." Unlock Prince Panji to the World! Leiden University Library. Bronze sculptures from Asia / by Martin Lerner Metropolitan Museum of Art Digital Collections. This page was last modified on 18 January 2019, at 17:25.